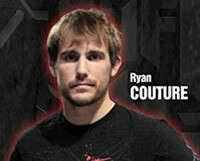 Ryan Couture will discuss his upcoming professional MMA debut this Friday, Aug.
13, at the STRIKEFORCE Challengers event at Dodge Theatre in Phoenix, Ariz, LIVE on SHOWTIME® (11 p.m. ET/PT, delayed on the West Coast). Looking to make a name for himself in the sport his father helped pioneer, Couture compiled an amateur record of 5-1-1 competing as a lightweight, with all five wins coming by way of submission. He has had access to a who’s who of MMA royalty as training partners and coaches, which, coupled with a solid amateur career, has given him the background and confidence to take his fight career to the next level. The younger Couture began his MMA training in 2006, working diligently to mature into a well-rounded fighter, adding Muay Thai and a dangerous submission game to his repertoire. In January 2008, he moved to Las Vegas to train with his father.